It is without doubt that everyone in life desires and yearns for that smooth flow in life but what is always at lack is that well orchestrated structure that will help keep that flow smooth and steady. You may ask what do i mean by flow in this context? When i say flow i simply mean being successful. So in this very blog post i will explain what structure has to do with your smooth flow in life. What structures are needed? Let's start by knowing what structure actually means according to dictionary definition. The dictionary defines it as the overall form or organization of something. There is a popular school of thought that when opportunity meets preparation success is achieved. Preparation in this very context simply means structure. Often times we desire for a smooth flow in life but while desiring ask yourself is there any structure in place so that when that very opportunity presents itself there is a structure already in place to turn it to success. Blogging: A Blogger that aspires for that big firm/company to work with him should first and foremost put his house in order, now what do i mean by that, i simply mean the person should be serious with what he or she is doing. Give your site an attractive design, make it appealing, publish quality contents even when it feels like you are not getting that attention at the initial stages trust me there are people watching from afar to know if you are really serious at what you do and in time they will begin to flood your mail with those eye catching deals. Trading: A trader that wants to venture into a particular line of business but don't have the required funds to execute that should first master that very trade (that is indeed the structure) proper so that when the funds needed is available it will not be mismanaged. Writing: A writer that wants to be like the William Shakespeare, Chinua Achebe, Charles Dickens, Leo Tolstoy or James Joyce of this world should first start from his/her environment because i know of a classmate of mine back in my high school days that always disturbs us with her numerous write-ups and stories that we gradually got accustomed to with time and now she is doing well in that field. Someone that read your stories, write-ups or novels in the past can recommend you in the future. Finally i would love to sign-off by saying this "Always put that structure in place if you want that smooth flow in life". It is true, you have to invest in building a solid foundation for anything worth having in life. It seems these days everyone is looking for overnight success without putting forth much effort and are frustrated when their plans don't work out. A solid foundation is very important in the quest to attain success in life. these are all so true especially when you want to build a solid foundation for your blog! Success never happens quick so its good to keep up to do everything and have patience! Interesting post. I had not thought of this before. I am always trying hard at everything I do. Exercise, food, work, family but I always take on too much and get stressed. I need to make more time to make a proper structure to my week/day and I think I would work more efficacy. Glad you could relate to this. Interesting article and so true when you want to build a god foundation for your blog! Success never happens over night you need to have patience and structure. So sad some neglect that fact but glad you appreciate that fact. After giving birth to my daughter I realised that the flow it's just a state of mind and I should let go of all that's holding me back. Our foundation is solid and we pick up from there! Hence the foundation is solid other things will fall into place at the right time. Such a helpful read. I totally agree with this article. It's hard to get into the flow without being organized in the first place. Being organized helps make things easier. Totally agree... some people thinks blogging easy task and few days work.when they dont get success they give up and switch to some other stuffs. Success is a mere result of patience and hardwork. It's really difficult to get into flow without being organised. Patience is a virtue that every blogger should have. Being a blogger myself I really agree with the point you have mentioned for bloggers. And how they should stay focused even when they are not well known as its true people do watch from distance and come to you at the right time. Yes they do watch from a distance, we just need to keep keeping on. Thank you for this reminder. I would have to agree that yes it is indeed important to put structure in order to get a smooth flow in our lives. Structure is definitely important! This is a great perspective. It is amazing how many bloggers aren't treating their site like a business. I never really saw myself as a blogger, but more as a online magazine or content creator. I think if you shift your perspective to more a professional focus, your entire site gets better. Great tips. This is a great article. And you are right, ideas and opportunities are all well and good, but one has to be prepared to carry it through. I love that you call it structure. Rejections should not in any way pull you down rather it should spur you on..
A good foundation is necessary to move forward. You can have a plan for almost anything but you need to have a foundation to make things happen! Good post! OH! Yes a good foundation should be our Priority. You made some really good points in here! Being serious in what you do and putting in effort will give you better results. Thank you for sharing this! Nice way of putting it. I am having a struggle now because I am transitioning my blog. I had always been blogging out of the blue. Now, I want more structure. So after all the articles I did in the past, I am redoing some of them. And it's really tedious! With what you are doing right now trust me it can only get better. Thank you for sharing the insightful tips. It's true that patience is very important, especially with blogging. Yes that is the Bedrock of every success. i love the message & snappy title lol. thanks for the tips and tricks shared. 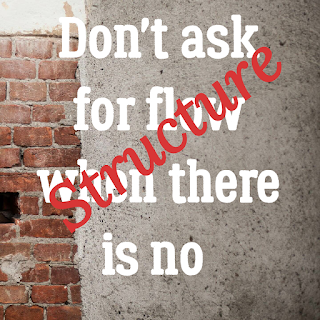 having the right structure is essential when you're writing. You know what they say, a good story has a great foundation. People seem to want the instant gratification. It's not as appreciated as when you earn it, and it doesn't come easy without that structure! It always feels great when it's earned. Glad that this could be of help. Thanks for an insightful post. It's important to have structure and foundation before moving forward on a project. It's hard to not see results right away but it's more of a marathon than a sprint and sometimes takes time. Yes it does but at the end it's worth the time taken. So true! Very important to build any business off of a solid foundation. And that takes time. Yes cause it's the most important thing. A solid base will definitely contribute to success. This and hard work, and a little bit of luck too. You are so right Catalina, thanks for your comment. Structure does provide some flow to a process - thank you for sharing. You definitely have to have structure when it comes to blogging. You need to be able to do things to make your brand consistent. And it's so important to have structure so people are confident with what you get and give on your blog. Most definitely @David, Building that Trust and Confidence is very important to any brand that wants to be successful.